Internet Addiction in Teens - What's so Great About the Internet? What’s so Great About the Internet, Anyway? Internet addiction, sometimes referred to as web addiction or online addiction, can manifest itself in many ways in today’s teens. If your daughter just spent an entire beautiful weekend glued to Facebook or Instagram, foregoing a trip with the family to somewhere enjoyable, she may be developing an unhealthy relationship with social media. If you checked your internet browser’s history only to find out your innocent, naïve teenage son has spent the last five afternoons accessing pornographic websites where the titles alone are enough to make you blush, he may not be using his time as fruitfully as he could. Although the examples we’ve given above are admittedly glib, they will still resonate with many struggling parents. The internet is a seductive place, especially for today’s connected teens who may be more likely to interact with friends on social media than they are to actually get on their bicycle and ride over to that same friend’s house. You have to accept it would be a challenge to connect face-to-face with someone you’ve never met in person and who lives in a different time zone! Therein lies the problem. The internet is a perfect storm for teens. Today’s social networking sites like Facebook, Instagram, and Snapchat let them represent themselves as whomever, or whatever, they want. Everything is edited by them, chosen specifically to present the face they want the world to see. And if they decide to change that face, then they just delete some pictures, add some new friends, and voila – new person! The internet has the potential to be a tool of discovery, learning, and even communicating when used in a responsible way. Unfortunately, immediate access and the abundance of possibilities can turn the web from a manageable part of daily life into a consuming habit. Social media usage has been linked to poor mental health. Researchers believe feelings of envy and inadequacy may underpin the problem, and so adolescents struggling with low self-esteem may be particularly prone to suffering ill effects. Instagram allows users to perfect their pictures and thereby offer an unrealistically idealized account of their life or appearance. Feelings of inferiority are not entirely shocking, given that most users of the app follow celebrity accounts that tend to show off lavish lifestyles and unattainable physical standards. Indeed, regulators across the world are now coming after many of the leading social media sites on issues of privacy and fake news, among others. Cyberbullying is another major issue because it offers a veil of anonymity to perpetrators. Online abuse can be belittling, terrifying, and humiliating, depending on the tactics employed by the offender. Although most victims know the perpetrators of cyberbullying in real life, it is also possible to fall victim to abuse from strangers. This is particularly likely when accounts are set to public or if the individual interacts with people they don’t know. Experts say that as many as 6% of internet users may be considered addicted, although some mental health professionals balk at using that term in a clinical sense. They argue that an activity can only be addictive when it causes a certain type of chemical reaction in the brain, and that’s hard to determine. But when you’re arguing with a teen about the amount of time she’s spending online and she just can’t get her paper done because her phone keeps alerting her to something new and exciting that is happening with her best friend, then call it what you like, it’s a problem – for you, the child, and the entire family. Many parents feel torn, though, about limiting their children’s time on the computer. If a teen is struggling socially, some parents believe any human interaction, even via the computer, is preferable to none. 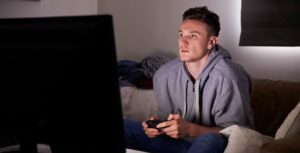 And with teens that are risk-takers or have questionable taste in friends, some parents feel they can better monitor and keep their children safe by letting them stay home, listening to music, gaming, or browsing the web. Moreover, many parents just want to avoid the tantrums, the cold shoulder, or the arguments that flare whenever the issue of computer time management comes up. There are a number of websites that you and your child can visit together to assess their level of addiction. To begin, try the addiction quiz at PsychCentral as a launching pad for a thorough discussion of your child’s internet browsing habits. Even if you don’t actually believe your child is addicted, the tests are a good way to initiate this dialogue and get them thinking about how they are managing their time. Although the internet is an unavoidable (and useful) part of daily life, moderation is key. If your child is spending the majority of their day glued to a smartphone and rarely spends time outdoors or socializing then it’s time to act. Filed Under: What Is Gaming Addiction?